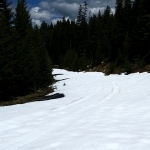 Snow Covered Road, photo courtesy of Umatilla National Forest. Winter may have come late, but it came in strong and set a couple of records. The Washington State Department of Transportation spent last night and early this morning rescuing people stranded at Snoqualmie Pass. All told, WSDOT escorted about 250 vehicles that had been stranded at the summit. A total of 53 inches of snow fell between Monday and yesterday. Ski resorts are closed, but are expected to open later this week. Hull says more snow and colder temperatures will move in on Thursday night and Friday. Meanwhile, National Weather Service Hydrologist Marilyn Lohmann advises that more active weather systems are poised to arrive. “The overall picture continued into mid- to late-February calls for below normal temperatures and continued active weather,” she said. Lohmann says there is only a low risk of flooding except in areas prone to flooding when temperatures warm. One thing she says that could cause problems are storm drains that get clogged because of the slush. The Oregon Department of Transportation is asking motorists to prepare for dicey driving conditions over the next three to four days. Interstate 84 through the Columbia River Gorge is a primary focus for ODOT’s snow and ice removal efforts. Another concern is the forecast for heavy rainfall in the western gorge. Heavy winds are also a worry. Motorists should expect a patchwork of conditions as they travel I-84 including snow, ice, freezing rain, wet, and bare surfaces. East of the Gorge, heavy snow is predicted for mountain passes. ODOT asks drivers to be prepared to install chains when required and to plan extra travel time. Snow removal teams are working around the clock. Motorists are asked to stay on main highways and avoid following GPS navigation devices onto unfamiliar routes. Many of them are not plowed or passable. ODOT also points out that if I-84 is forced to close, Washington State Route 14 is not an option for heavy trucks.